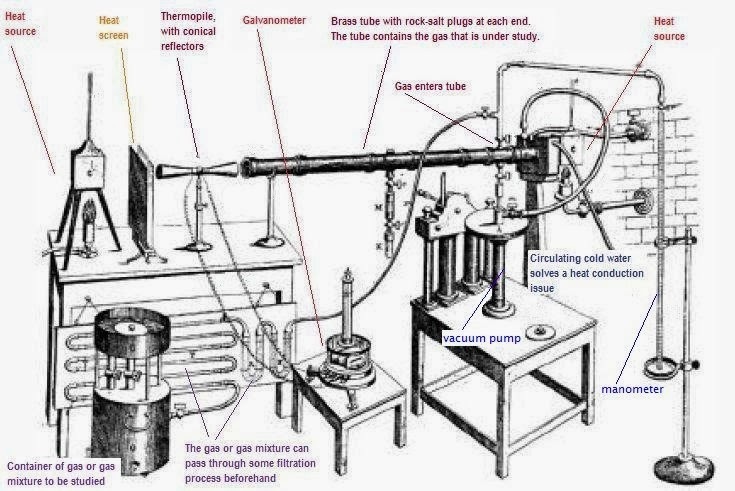 Refuting the greenhouse effect: John Tyndall's thermopile apparatus and experiment is inadmissible in climate theory. Explaining the missing 98% of our 'greenhouse' atmosphere. Modern climate science's fundamental premise - stated by all parties in the great climate debate - is that the greenhouse gases (less than 2% of the atmosphere) are so because they absorb radiant infrared (IR) heat (as derived by IR spectroscopy), and are (to carbon-climatologists) a main climate driver, past present and future. This premise has its origins with the John Tyndall 1859 thermopile infrared gas analysis experiment. The (remaining) non-greenhouse gases (N2 nitrogen and O2 oxygen, more that 98% of the atmosphere) are distinguished from the greenhouse gases by their (said) inability to absorb (infrared) heat - deduced or inferred from the same experiment. All IR instruments use the same basic technology, thermopiles. Tyndall's apparatus is today cheaply and easily available and is used in infrared thermal cameras and non contact infrared thermometers. Standard practice of these instruments suggests his findings and conclusions to be false, and extrapolations thereafter an illusion. Is Tyndall's experiment a lasting remnant of 19th century trickery surrounding electricity - electrickery? Greenhouse proponents argue: it is the gases - due to their molecular vibrations - that are special. They either trap heat, or don't. I argue: it is the instrument that is special, they either register a gas - on its molecular vibrations - or they don't. Standard practice and knowledge of IR instruments. It is well understood by practitioners of (thermopile) IR instruments that (thermopile) IR detectors do not always measure the real temperature of a substance: they discriminate on substance properties that are not at all thermal properties, and so give a wrong picture of our atmosphere. This premise has lead to a false belief in, and development of, the so called greenhouse climate theory. The cause of this transparency is to do with the symmetric vibration of some substances. Correcting for this discrimination, N2 nitrogen and O2 oxygen are also greenhouse gases; they have a measured real temperature, they 'trap heat', but as they are invisible to IR detectors. IR (thermopile) instruments will, by the laws of physics, register them as having no temperature. Tyndall has confused absorption with opacity - a property of light; and so wrongly concluded that the said greenhouse gases (inferred from the experiment) are special, when it fact it the instrument that is special. The IR detector may be analogous to the radar. The radar 'sees' the classical fighter jet - the likes of the F-15 Eagle - but it will not see the 'stealth' F-22 Raptor. The IR thermopile detector measures the 'greenhouse' gases, but not the non 'greenhouse' gases. Putting numbers to the analogy: jets (non stealth) per per million Aircraft - just like the 'parts per million volume' greenhouse gases. We would see with our eyes: 1 million aircraft total; 2% or 20,000 would be classical non stealth fighters like the F -15, and the remaining 98% 980,000 would be stealth like the F-22. It would be wrong to conclude from these instruments that the Raptor (and the non 'greenhouse' gases) are not there and are benign just because they don't show up. If we only used radar, we would have a totally wrong picture of the reality. Imagine a sauna made with walls of IR transparent germanium, and heated to sauna temperature. To a noncontact IR thermometer it would show – unlike the traditional thermometer – the outside temperature. It would ‘see’ right through it (apart of course for the water vapor and other trace gases). It would be useless. In an earlier entry I cataloged the evidence of the evidence of CO2's heat trapping property. Having found that CO2 doesn’t show any evidence or repetition (at least at any significant level so as to be measurable or notable) I set about in this entry to explain why CO2's heat trapping doesn’t repeat. Why is it that we think it does? My conclusion is very disturbing: the foundation argument or premise of 'heat trapping, climate changing, CO2 does not appear to be consistent with the related fundamental laws and textbook knowledge of physics. I have found all of the foundation arguments can be (easily) refuted, just by studying these laws in detail. Inspired by the work of Galileo, I am calling this entry ‘The Gassy Messenger’, I could have equally called it the Dark Climate. 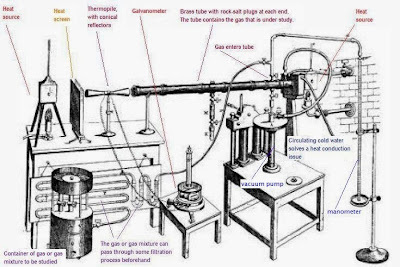 Everybody who discusses greenhouse climate theory should be aware this instrument (just as with a telescope to the astronomer) and have experimented and discussed their findings in light of the following theory and industrial application of the devise. This entry was written by me, an amateur, but the knowledge was attained from all fields of physics - including astronomy. I call upon all physicists to explain their position on climate change, not in terms of changes in climate, but in terms of, and in reference to the problem below. This entry is not set as crystal, is still liquid, but in time I will get there. In this (following) entry I shall: review the Tyndall experiment and its implications; show that the experiment's findings are wrong, misinterpreted and misattributed; and go on to - with reference to industry publications - reveal the real life problems associated with measurements taken from IR instruments. I shall then go on to show - using both primary and secondary publications - that the atmosphere is made up of (only) greenhouse gases – i.e. that oxygen and nitrogen are also heat absorbent. I will show that CO2 is thermally typical, and not at all special. .. the vast majority of the atmosphere is not composed of gases that cause the greenhouse effect. Molecular nitrogen (N2) and oxygen (O2) make up roughly 98% of our atmosphere, and neither is a greenhouse gas. So, although the greenhouse effect is very powerful, a very small fraction of Earth's atmospheric gases generate the effect. The 'greenhouse effect' has as its centre premise - held today by all climate scientist's - conclusions made from the 1859 Tyndall experiment. John Tyndall experimented using newly developed electrical technology (the thermopile) and discovered (what he thought were) a small set of gases that absorbed heat; gases now known as the greenhouse gases (water vapour, CO2, ozone, and methane). From this experiment the greenhouse effect axiom was formed. How is it the atmosphere is warm at all when less than 2% of the atmosphere are GHG's and trap heat? How can atmospheric convective phenomena - the likes of the sea breeze - be explained by these (heat trapping) greenhouse gases alone? Where have the 98% (dark gases from dark matter and dark energy) of our atmospheric gone? If N2 nitrogen and O2 oxygen are not greenhouse gases then they should hold no heat, and have a temperature of absolute zero. This not true, something is wrong: either the greenhouse gas axiom is right (and if this so, we must except this dark climate paradox), or the axiom are wrong and their founding experiments misinterpreted or misattributed. Greenhouse beginnings: the 1859 Tyndall experiment. Tyndall’s experiment can easily be repeated and his findings reasoned in a modern context. The apparatus used is the readily, and relatively cheaply available non-contact infrared thermometer, or its more advanced relative, as shown in the clip above, thermal imaging camera. Though these modern day ‘gadgets’ are more advanced and more adjustable than that available in Tyndall’s time, they operate using the same sensor technology, the thermopile. Infrared was discovered by Sir William Herschel as a form of radiation beyond red light. These "infrared rays" (infra is the Latin prefix for "below") were used mainly for thermal measurement. There are four basic laws of IR radiation: Kirchhoff's law of thermal radiation, Stefan-Boltzmann law, Planck’s law, andWien’s displacement law. The development of detectors’ was mainly focused on the use of thermometer and bolometers until World War I. Leopoldo Nobilifabricated the first thermocouple in 1829, which paved the way for Macedonio Melloni to show that a person 10 meters away could be detected with his multielement thermopile. The bolometer was invented in 1878 by Langley. It had the capability to detect radiation from a cow from 400 meters away, and was sensitive to differences in temperature of one hundred thousandth of a degree Celsius. But to use them the operator should have an understanding of the underlying (laws of) physics that the IR instrument responds to. They must understand its limitations; just as a pilot understands the limitations of an altimeter or compass and how they too can give misleading information. To cover this new knowledge these limitations, all IR measuring instruments come with an operating manual, that are readily available to read on the internet. There are also training videos such as the one below on IR cameras and transparency. What these publications spell out: (among other things) is that the IR instrument measures infrared radiation and not temperature as such, and that they only read what the instrument can ‘see’ (opacity and transparency) at the instruments set range of frequencies. This is to say: if something is opaque to IR, at the set frequency range of the instrument, it can see it, and it can therefore measure it; and if something is transparent, it cannot see it, and therefore cannot measure it. This below training clip spells this out clearly. An operating manual that develops this knowledge is pasted below. It also clearly spells this out the IR properties of different substance, at different wavelengths - substances collectively known as 'selective emitters', of which many of the gases of the atmosphere are said to be, as highlighted. Without knowledge of the above theory, temperature measurement would seem a kind of magic, but one only has to measure the temperature of a warm object through glass to see that it is the glass that is measured, and not the warm object - even if the object behind the glass is several hundred degrees centigrade. Glass and CO2 are both visibly transparent, and IR opaque (at the frequency range of most detectors) - but we don't call glass a greenhouse solid. 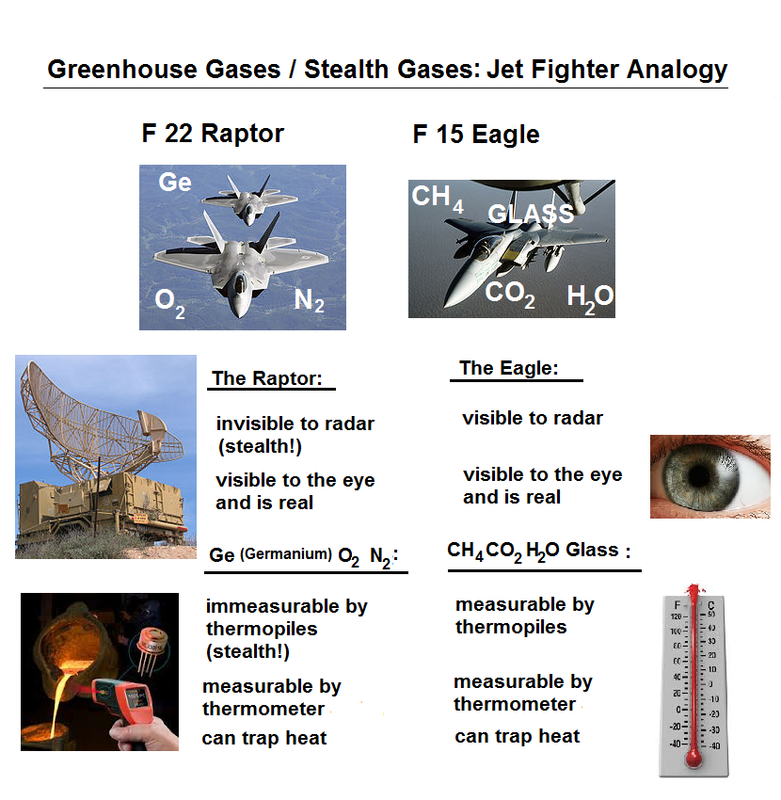 If a glass (a greenhouse solid by inference) does not pose a threat to the climate, why should any gas? Air and CO2 gas transparency and opacity is demonstrated in the clip below? Is the clip measuring temperature, or CO2 opacity? Opacity. In fact the clip basically demonstrations how CO2 concentration detectors work. On the other hand, there are some materials that are semi transparent to IR instruments (just like atmospheric N2 nitrogen and O2 oxygen), these are germanium - as demonstrated in the clip above, salt crystal, and thin plastic: again, because of this transparent property of the substances it is not to say these substances don't hold heat, but rather the instrument discriminates on their opacity - they don't measure. That N2 nitrogen and O2 oxygen are transparent to IR is not to say they are not absorbent to heat: proof of this is they both have a heat capacity, they are both the majority gases of the atmosphere, and the atmosphere is warm and not absolute zero. It is to say they are transparent to IR instruments, and do not measure. In light of this knowledge, theory, and application of modern day IR instruments, the early Tyndall conclusions seem to be outdated: his conclusions need updating. The instruments measure a property of light and not the temperature: air maybe IR transparent, but it is warm, it has a temperature. This clip, and the original 1859 Tyndall Experiment, is not a demonstration of heat (absorption), but rather a demonstration of the physical transition properties (opacity) of (infrared) light and its affect on different substances, namely, in the case, air and CO2. What we see is the image of a flicking candle in the IR camera, and as the CO2 is let into the (sealed) cylinder the bright candle image turns to a blue colour. It is concluded, just as Tyndall did that the CO2 absorbs the infrared or is essentially trapping the heat from the candle. From the above literature and application of the instrument and alternative conclusion should/could read: The bright candle image turns to a blue colour as the CO2 is opaque to the infrared the frequency the camera is measuring at and that the gases before the CO2 is let in are transparent at that frequency. To test this reasoning we could have equally placed glass in front of the candle and got the same of similar result as the CO2 It should be noted that Tyndall used rock salt crystal to contain the gases – rock salt crystal is transparent at that frequency. In the Stewart demonstration rock salt is not used, but (IR transparent) thin plastic ‘clean full’ is. This can clearly be seen at time.. That the image colour turned blue shows the detector measuring the IR radiation emitted from the CO2 and thus its temperature. We could deduce from the colour that the CO2 that it is cold (which it should be coming from a pressurized state) or at least the temperature of the ambient gases it displaced. If not used properly or understood, findings from IR instruments risk deceiving: if gases (just like the solids) are transparent to IR, it does at all mean they don't absorb heat. And the question is still begged, how is it N2 and O2 are warm? To expose why (and what) IR detectors don't see, we need only understand Raman spectroscopy. Raman spectroscopy is well explained in the following clips. I suggest you play them more than once to yourself as they are very insightful and offer perfect solution to the dark climate (N2 O2 invisibility) paradox. As shown in the above video clip CO2 has a predicted IR band that only shows with Raman Spectroscopy. This is supported by the following images/references. In the first the symmetric stretch at 1537 cm-1 is predicted 'B', and in the following image below, a 'cartoon' image of CO2 clearly showing bands A, C and D of CO2 in the IR (spectroscopy) spectrum, and in the lower cut, the 'green' Raman CO2 showing the predicted band B of the above cut. This shows that IR detectors are discriminant to only anti-symmetric movements. N2 and O2 are by their nature blind to IR detectors because they are not anti-symmetric. This hidden Raman signal (well inside the mid IR) may explain why the atmosphere is warm. Why is Raman spectroscopy totally ignored when deriving the GHGs, when N2 and O2 are Raman active, and the likes of CO2, CH4 and H2O are too? With a knowledge of Raman and IR spectroscopy, the properties of light, and of substances, it is clear that the GHG’s and its GH theory are derived by cherry-picking only one side of the knowledge. Tyndall’s apparatus (the thermopile) discriminates on atomic properties that are not at all associated with real thermal properties. If there is thought to be a relationship, it is an illusion. If it is assumed a room at thermal equilibrium - where all substances are of the same temperature, IR detectors will return different temperature readings depending on the vibrational structures of these substances. 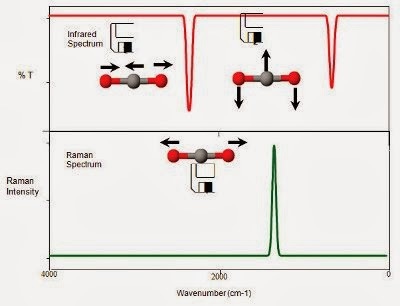 Both N2 and O2 are vibrational symmetrical by nature: they will never show up in IR detectors or spectroscopy, but will in Raman spectroscopy - IR's complement. Molecules such as CO2 - which are both symmetrical and anti-symmetrical, will show in both. If Raman spectroscopy was the only test we had to analyse the IR spectrum of substances, we could have equally have concluded that N2 and O2 are the (only) greenhouse gases. This discrimination renders IR thermal detectors inadmissible. 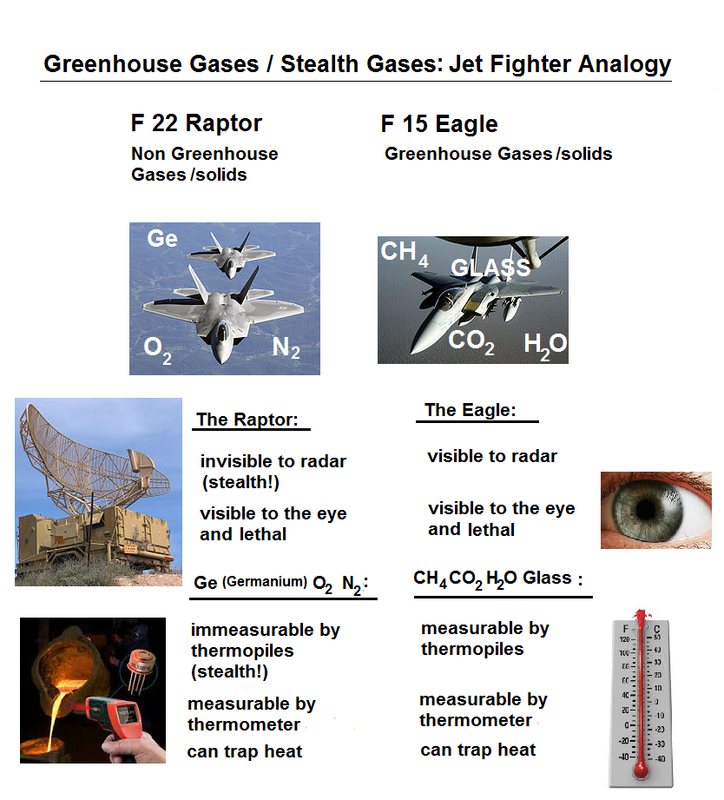 With the IR detector inadmissible: all gases are greenhouse gases, and the (special) greenhouse climate theory myth. The 2% (volume) of said greenhouse gases should be revised and relegated to 100%, by adding N2 and O2 (and others if so). Any assumptions by any climate models,or climate knowledge, or claims that the atmosphere consists of around 2 % (volume) special greenhouse gases will need reviewed – as said above. Thermal and energy properties of substances are measured in terms of specific heat capacities.